Allenhayes is a handsome, semi-detached, Victorian property located in one of Salcombe’s most popular residential areas. 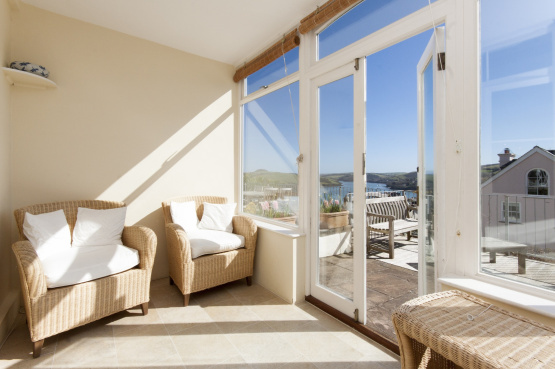 Its elevated position ensures that most of its rooms enjoy spectacular views of South Pool Creek, East Portlemouth’s village and sandy beaches, and the National Trust land at Snapes Point. Allenhayes is a property that befits its Victorian origins with a rendered exterior topped by decorative gables supporting a slate tiled roof and red brick chimney. Its interior boasts an abundance of period features with high ceilings, decorative cornices, picture rails, original doors and door furniture, and fitted shelves and cupboards all contributing to the elegance of this property. Allenhayes’ generously-sized rooms, including five bedrooms, are spread over three floors. Most are served by sash windows that allow plenty of natural light while also offering spectacular waterside and rural views. There is a large decked and paved front sun terrace, a paved side terrace, an elevated sun deck and a recently landscaped garden, mostly laid to lawn, with panoramic views. The top garden can also be accessed via a bridge with handrails from the second floor landing. Allenhayes is on the market at a guide price of £1,450,000 through Marchand Petit’s Salcombe office. Further details may be obtained by telephoning 01548 844473.